eCommerce is finally getting better for the mobile customer. With integrated payments tied to simple one-touch interfaces like fingerprint sensors, mobile customers have fewer barriers between your product page and a completed checkout. The combination of the improvements with mobile payment technology and more and more mobile users is leading to a real tipping point for mobile conversions. That means any eCommerce stores trying to remain relevant in 2019 needs to stay on the cutting edge of the latest mobile payment technologies. Mobile payments are rapidly rising, with payments looking to hit $4,574 billion by 2023. This is largely thanks to major retailers getting on board, supporting popular methods like Android Pay, Samsung Pay, and Apple Pay to streamline the customer experience at the register. Many retailers also provide their own custom apps. Starbucks, for example, accepted 10% of its orders in the fourth quarter of 2017 from customers using the official Starbucks mobile app, which has their biggest competitors scrambling to match their mobile offering. This transformation in the brick and mortar retail space is a likely boon for eCommerce mobile conversions. It’s increasingly normal for average mobile users to set up their payment information through multiple apps. A whole new customer base is already used to processing payments with PayPal at everything from established big box chains to their local bakery. It’s a small leap from this new consumer habit being leveraged to increase eCommerce conversions from mobile users. Many mobile users won’t use the traditional method of typing their query into a search box and sifting through a list of (hopefully!) relevant information. They’ll simply ask their phone about something they want to buy, and in many cases receive a grand total of one answer. This means your strategies to get customer eyeballs on your mobile eCommerce product pages have to expand to target these types of users. It’s a whole different world of SEO. This can be a tough proposition, as the user experience for people looking for a specific product on mobile is becoming extremely slight: ask for a product, get a voice response or get sent directly to a product page, buy said product immediately with pre-set payment information, and move on without knowing if you even got the best price. For larger eCommerce businesses, the easy route is partnering directly with Google, Amazon or Apple to have their eCommerce features easily accessible through simple voice commands. But for most eCommerce businesses out there, it means changing SEO practices to include popular voice keywords, then making sure their mobile landing page is as painless to use as possible. Using voice implies the need for quick information. That’s a buyer that’s likely to be a quicker sale conversion than most. The real problem in 2018 is in making sure they end up looking at your product page. Recurring payments are increasingly normalized for many consumer products. And it isn’t limited to the eCommerce giants like Amazon with their auto-replenishment schemes; the concept continues to see major growth among smaller startups with 800% growth in the sector since 2014. Mobile users are often looking to solve problems fast. With consumers no longer batting an eye at the idea of recurring payments for items they’ll be re-buying repeatedly anyway, 2018 is the perfect time to target your products for any subscription potential. Prominently displaying subscription availability on mobile pages is crucial. One mobile conversion could become countless recurring payments for years to come. 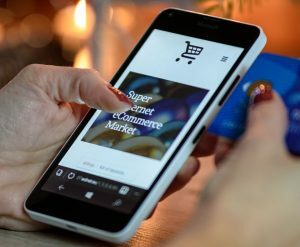 To learn more about the growth of mobile eCommerce in 2018, and how to use a smart, SEO-led online storefront design to take advantage of the bleeding edge of popular mobile technology, contact us at Smart Link Solutions today.